I just finished taking a 30-minute personality test called StrengthsFinder that identifies your top 5 strengths. The idea is that once you've identified your top strengths, you will profit more by working on your strengths rather than on your weaknesses. Interesting idea. Harmony. Our conversation will be pleasant and productive. Even if we hold different views, we can build on common ground. Rather than spending energy on debate and confrontation, we'll discuss practical matters and get things done. Consistency. I treat all people with dignity and avoid any kind of favoritism, bigotry, and dishonesty. If I agree to do something for you, I will keep my word. I create checklists, procedures, and systems to make sure that I don't forget to do things. Maximizer. I can take something great and improve it to be even greater. Hand me good work, and I'll make it even better. Hand me shoddy work and I will be grumpy. I also have a knack for noticing the strengths in other people. 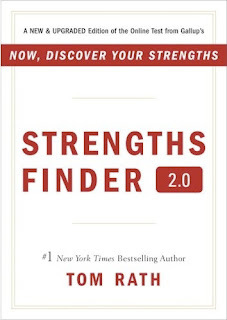 If you want to take the test, you'll need to buy the $20 book "StrengthsFinder 2.0". 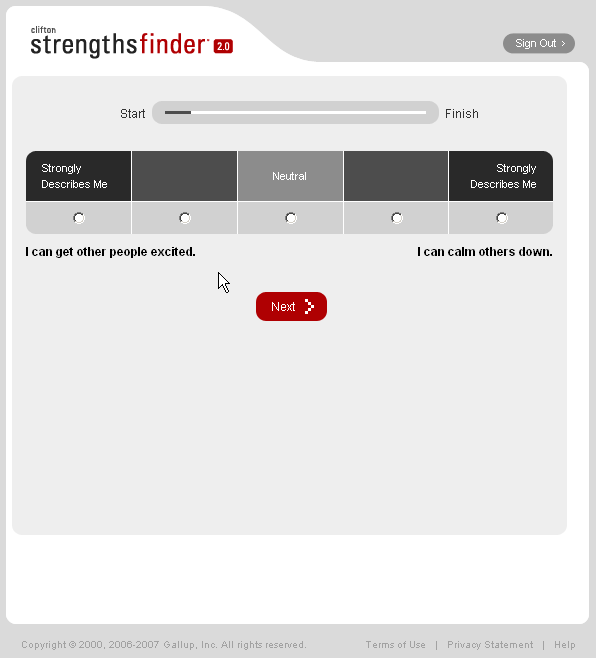 It has a one-time-use code in the back that you can use to access the StrengthsFinder website. posted by Jonathan at 8/09/2008 05:50:00 p.m.
Have you ever wondered if your strengths change over time. I think it does. I took it about 5 years ago (thats when I had completed reading the book). I am certain that it would have changed now... seeing your blog, I am certain I should take one again. By TheSpeaker, at 8/19/2008 1:46 p.m. I think one of the Amazon reviewers said that his changed a bit since he took it 10 years ago. By Jonathan, at 8/19/2008 10:18 p.m.
Well it definitely worked on you Jon! Those three are you through and through! By Thomas David Baker, at 8/23/2008 2:11 a.m. Thanks Tom - I'm curious what your three are! By Jonathan, at 8/23/2008 9:32 a.m.